WW2 economy example by A. Stanley & Sons, Walsall. A mailed gauntlet for the right hand, fist clenched, palm to the front, with a billet on the wrist inscribed “RAC”; issuing from the wrist upwards, two concentric circles, barbed; the whole surmounted with a Crown. Two brass blades to reverse. Formed in April 1939. 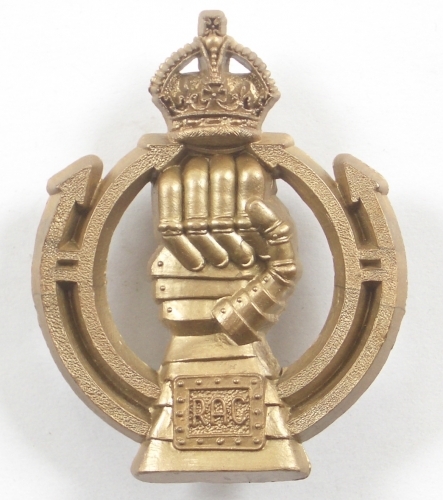 Mailed fist pattern badge superseded RAC crowned wreath pattern in 1941.